This piece is a collaboration between cross stitch designer and artist. I love this piece of artwork by my friend Maureen Mace, and together we have worked to bring her Bird & Hearts silk painting to life in a new medium. This would look fabulous stitched as a piece of wall art or a cushion cover. The finished design measures 200 by 150 stitches. If stitched on 14 count aida or 28 count even weave, the finished measurements will be approximately 15” x 11” (38 x 28cm). Your fabric should measure a minimum of 21” x 17” (53 x 43cm) to give a 3” (8cm) border around the outside for framing. You can, of course, use a different count of fabric, and your finished size will be different. There are thirteen colours in this design. The design comprises whole stitches only, all to be done in two threads. The chart is designed for stitchers of all abilities, but would be an excellent starting piece for a beginner as there are large blocks of colour which are easy to fill in and make for a fast finish. 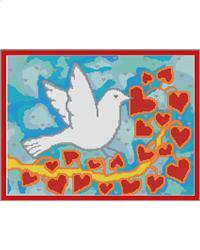 I have chosen to use some DMC Silk Threads in this design for the bird outline, the tiny hearts, and the red hearts. If you don’t want to use these, then the corresponding ordinary thread colours are listed too (762, 415, 606). The same symbols apply, as per the thread key. You could also use metallic silver around the bird and for the small hearts, as the original artwork used metallic paint. The original artwork was painted onto hand dyed silk, so the piece could also be stitched on a hand dyed fabric, which would give the mottled background I have tried to achieve with the various shades of blue. You would then not need to stitch the background colours. There are plenty of choices here to make this piece really unique. Project Size: 15" x 11"